this is a bit difficult to describe, I'll attach a commentend screenshot for better unterstanding. Blurring by me. When using CB RA for working on a remote computer, setting the window to nonscale and the remote desktop is too large for the local window, you get scrollbars. That's obvious and fine. Now, when operating these scrollbars to access undisplayed areas of the remote desktop by pointing the local mouse at those scrollbars, click-and-hold left mouse button and moving the pointer, the mouse also operates the underlying remote desktop. 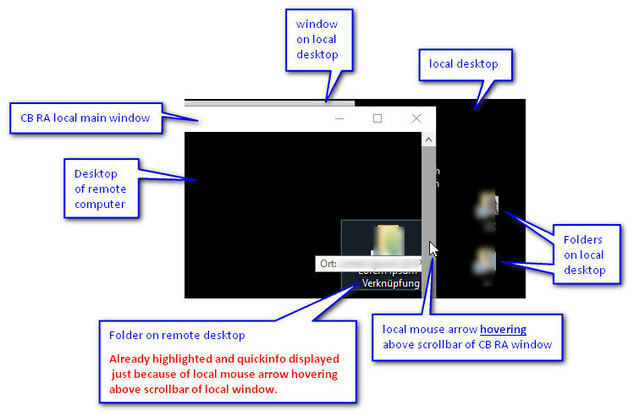 In the screenshot you can see the remote folder highlighted and the mouseover infobox displayed just because the local mouse pointer hovering above the scrollbar, nothing clicked yet. If I now would click-and-hold and move, the mouse also would grab the remote folder and move it around the remote desktop while in parallel locally moving the scrollbar. Is this a known behaviour? I find it difficult to handle, so I consider it a bug. , thanks for your detailed explanation! It is not an expected behavior. We will most likely fix it by the next update. thank you very much for the fast and pleasant feedback. I have an additional detail regarding this matter. A similar effect happens with the main CB RA toolbar. Please see also the enclosed commented screenshot (blurring by me). The mouseover effect for both layers (remote and local) also appears with the toolbar, if it unfolds over a remote desktop window, in this example a Firefox with several tabs open. As you can see, hovering above the chat icon also highlights the underlying nonactive firefox tab. Other than in the scrollbar example a mouseclick seems not to "go through" to the remote firefox, since clicking in that example opened only the chat window and did not activate the underlying FF tab - the one with Google in it stayed selected. Seems related to the other bug, although not with the exact same (mis)behaviour. 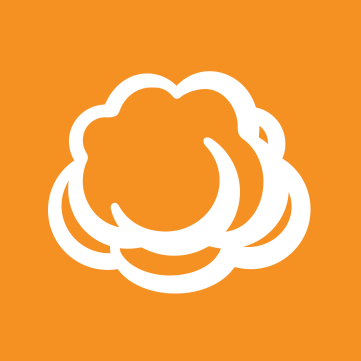 Welcome to CloudBerry Lab Forum! Thank you for visiting! Please take a moment to register so that you can participate in the discussions! Installing CloudBerry Linux CLI locally without root access?